Hard Candy - Spring/Summer Makeup Collection Review, Swatches and Makeup Look! Hard Candy has really stepped up their makeup game lately - they are releasing a ton of new on trend products! They are affordable, do not test on animals and sold at your local Walmart stores so they are easy to find as well! I love to find good, affordable products so I was excited to try out a few products from the Spring/Summer 2017 Hard Candy line! Hard Candy Lip Artiste Lip Contouring Wand in "Wine to Burgundy" ~ $7.98 CAN. This CONTOUR + HIGHLIGHTING duo is designed to enhance the appearance of lip shape and size. 1. Matte lip contour pencil revises lip shape and creates shadows. 2. Iridescent highlight enlarges the appearance of light on your pout. This is a liner and highlighting duo! I really like the texture of the liner and it can easily be used to fill in the entire lip without feeling dry at all! The highlighter is really pretty and I love to add a touch right to the middle of my bottom lip! Hard Candy Wet Ever Bold Hold Lip Lacquer in "Genius" ~ $7.98 CAN. 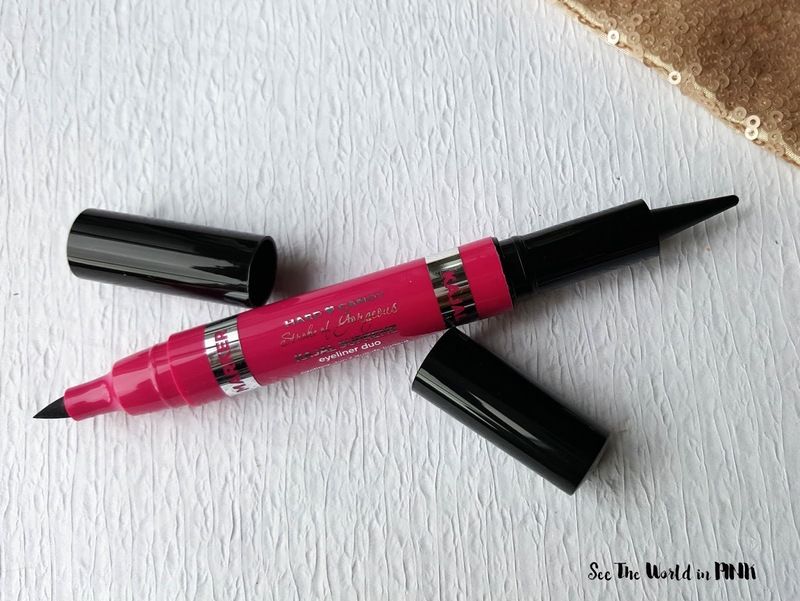 Bold hybrid lip lacquer that combines the long wearing properties of a liquid lipstick with the shine and hydration of a lip gloss. With an opaque formula that is both hydrating and not sticky, it is always comfortable and never drying on your lips. This offers a really intense, bold look! I was so impressed with the formula! Genius is described as a brown, which isn't normally a shade I reach for, but I love this shade! I actually think the color is a little more appropriate for fall, but love the glossy finish for Summer! 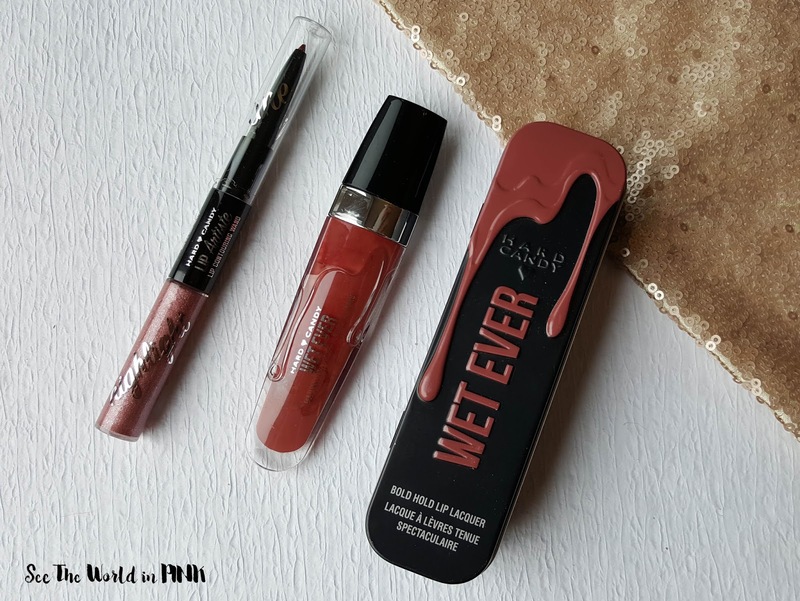 This stays on well and isn't sticky - it will transfer as most glosses do, but it lasts for a long time! Hard Candy Sheer Envy Color Correct Perfecting Powder ~ $7.98 CAN. 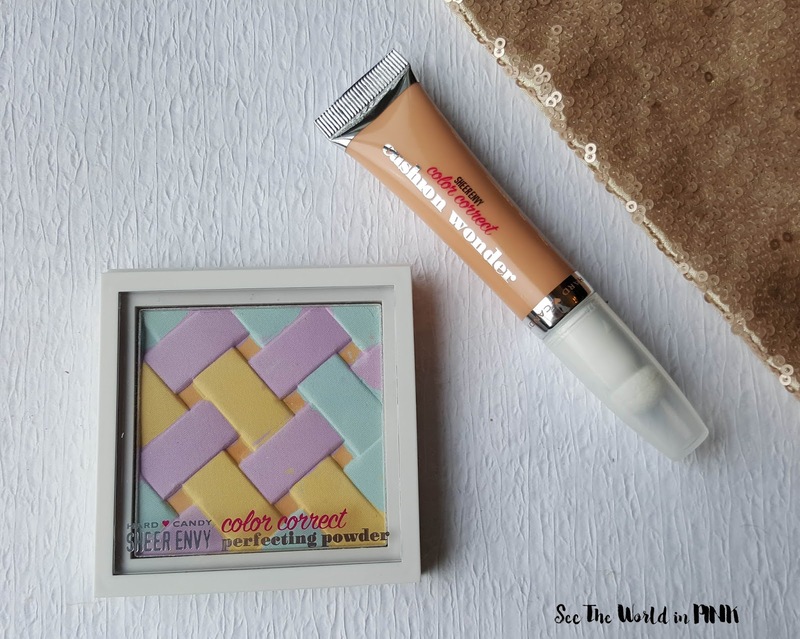 A sheer and luminous powder that mattifies and sets makeup. The pastel pigments are designed to individually correct skin concerns. 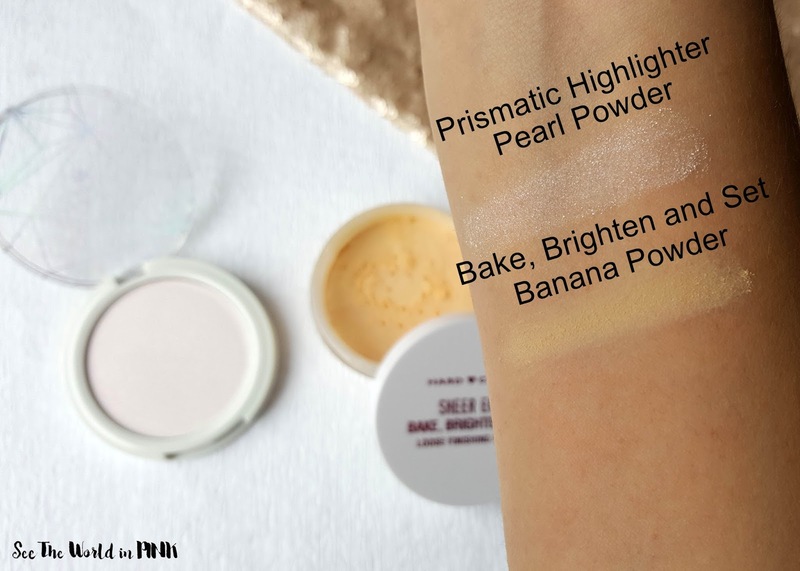 This is a color correcting setting powder - it is interesting that it suggests it is both luminous and mattifying at the same time; but strange enough I actually found that to be true while using this! I really like this is as a setting powder and thought it finished added a flawless finish. But one thing to note, it is quite pigmented so be easy when applying or it is noticeable - so less is more! Hard Candy Sheer Envy Color Correct Cushion Wonder in "Peach" ~ $6.98 CAN. This color-correcting serum instantly provides weightless color correction of any skin coloration concern. Packaged in a tube with a cushion tip, no additional tools are needed! Blend into your skin to target and CORRECT your skin concerns in 1 simple step! 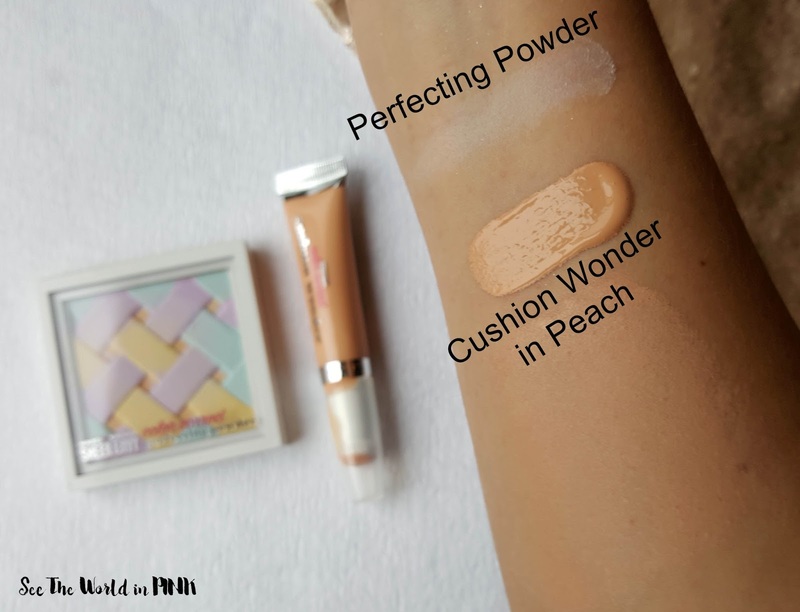 I have been waiting to find a good Peach highlighter and need to look no further - I am in love with this concealer! Peach targets and neutralizes dark under eye circles! I have tried a few to no avail so I am thrilled to find this - it is very brightening to the under eye! This also has a cushion applicator which I love, but I found it easy to apply with, but a little harder to blend in! The product comes out quite heavy so I got too much on my under eye while trying to blend in, so I just use my damp sponge instead! 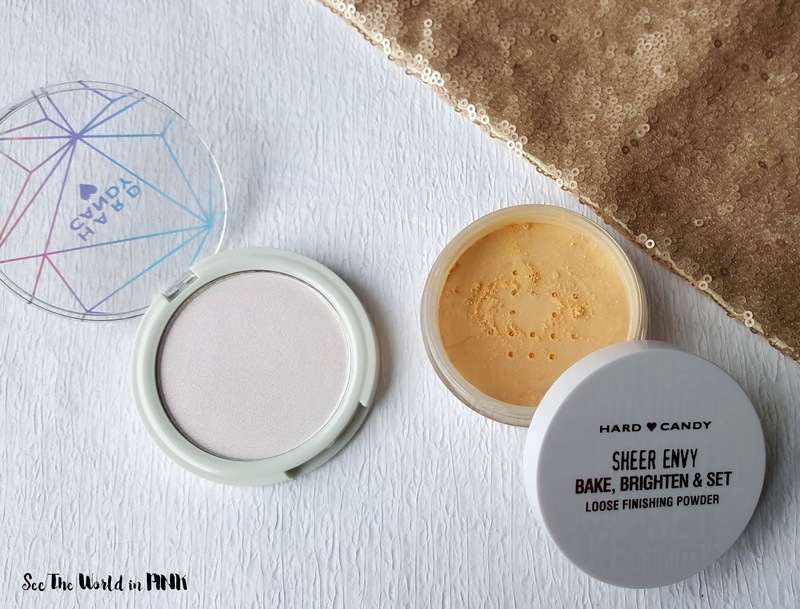 Hard Candy Sheer Envy Prismatic Highlighter Pearl Powder ~ $7.98 CAN. So Iridescent. The light-reflective pearls accentuates the high points of your face and cheek bones. Flattering on all skin tones. I was excited to try this highlighter - it is almost a pinky purple in the package. But, on the skin it is much more white toned. Also, there is some chunky glitter in this as opposed to a gentle shimmer - it is too glittery for my liking as a highlighter though. Hard Candy Sheer Envy Bake, Brighten & Set Loose Finishing Powder in "Banana" ~ $6.98 CAN. "Baking" is a makeup artist technique that prevents creasing and gives a natural radiance to your undereye area. 5 minutes to day-long perfection! Oooh, I love to see a drugstore banana powder - I find them so hard to find! I love to use banana powder to brighten and set under eye concealer! This is designed as a baking powder, so apply a good amount with a damp (or dry) sponge, leave on for a few minutes and wipe off excess powder. I found this to be quite a dark banana powder - it did work for my light-medium skintone, but it was just good for my skintone. I think anything lighter and this would be too dark on! Hard Candy Stroke of Gorgeous Kajal Supreme Eyeliner Duo ~ $7.98 CAN. This dual-ended eyeliner equips you with both a soft kajal eyeliner and an ultra-black long-wearing liquid liner: everything you need for perfect eyeliner every time. Glide on the soft kohl kajal along the lash line’s inner rim and smudge to fade around the edges. Then, line top lash line with the blackest black, precision tip liquid liner for eye-popping drama! 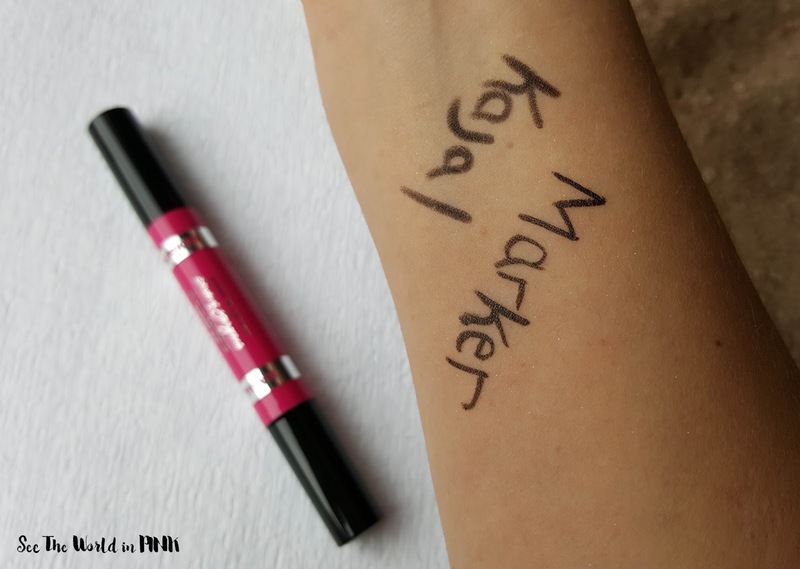 This is a liquid and pencil liner. I'm not a huge fan of pencil liners, but this one went on quite smooth. It is a bit thicker of a tip then I usually like, but it is meant to be smudged! I liked the precision of this felt tipped liner - it went on really smooth and was easy to use! My only note, it that i'm used to a smaller pen so this thicker style took me a bit to get used to! Hard Candy Look Pro! Metal Eyes ~ $8.98 CAN. 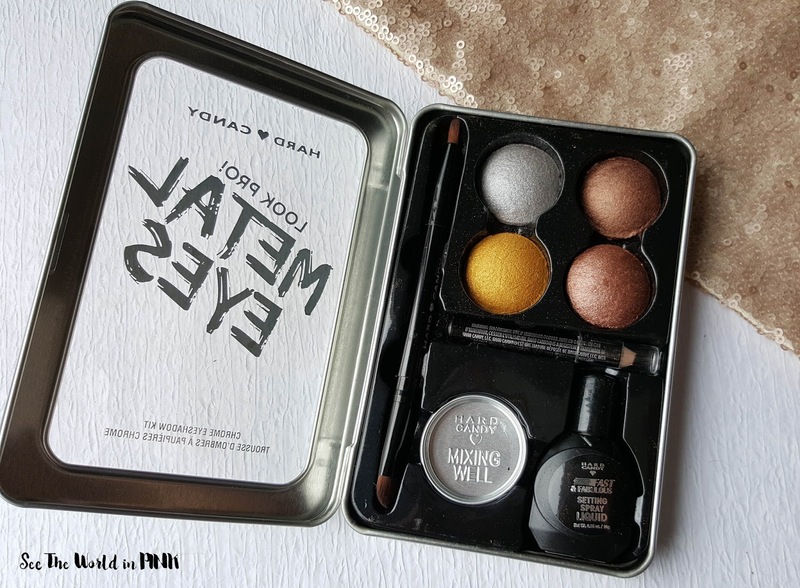 The Hard Candy Metal Eyes Chrome Eyeshadow Kit is an innovative shadow kit that allows you to achieve the hot runway trend of metallic eyes. This kit includes 4 highly pigmented metallic pearl eyeshadows, mixing liquid, a mixing well, a professional dual-ended eyeshadow brush, and a mini black eyeliner. Choose your own intensity by mixing the eyeshadow and mixing liquid together for your desired look. These shadows can also be used dry for a less intense metallic effect. What a great deal - $9 for a liner, 4 shadows, and mixing product! This is great! I was totally surprised with the pigmentation of the shadows! 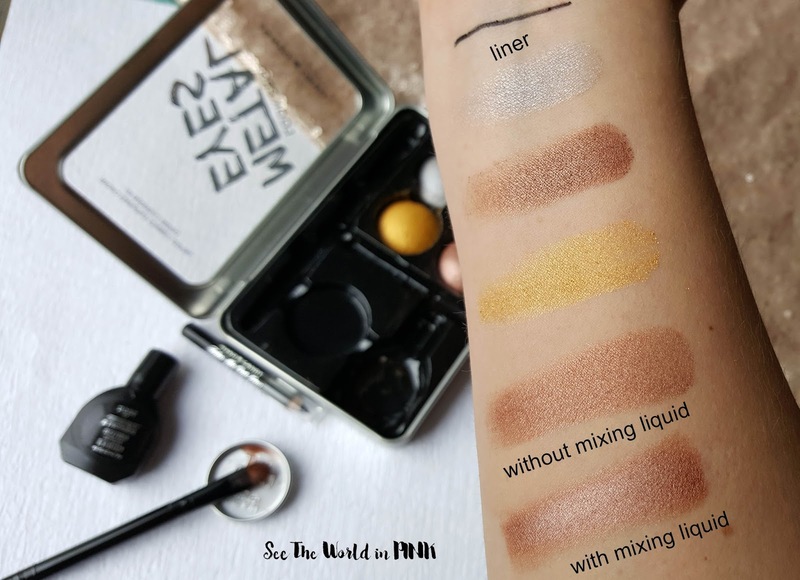 All 4 are swatched alone and then the last color is swatched with the mixing liquid as well! These all have a metallic finish so it isn't a stand alone palette, but I really like these shadows for a bold eye look! Also, the liner goes on smoothly and I like that a mixing well was included with the mixing liquid. 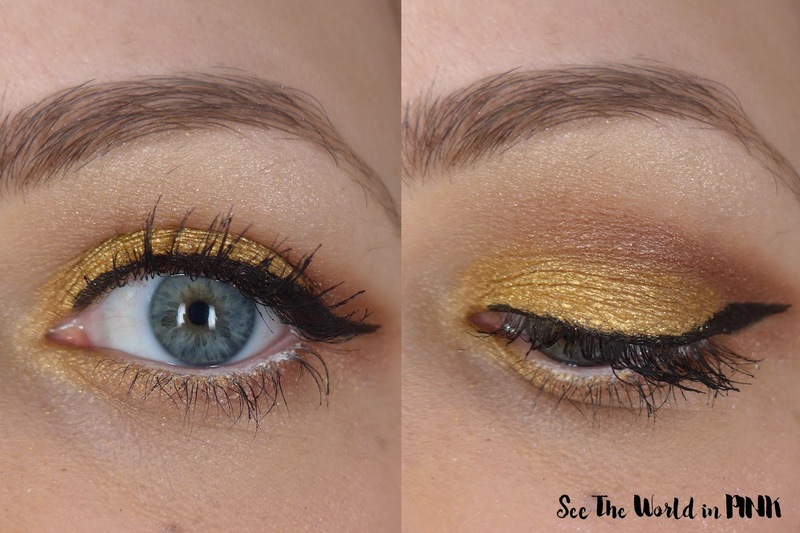 You can see how bold the gold shadow is when used with the mixing liquid! The bronze works well in the crease too used on it's own! I like the wing I was able to create with the liquid eyeliner as well! 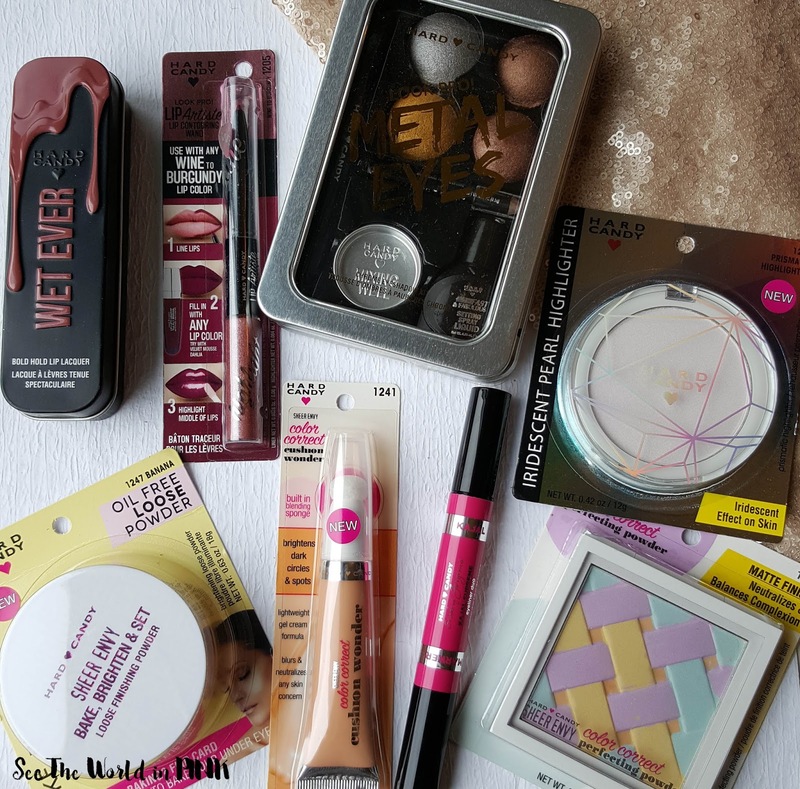 Overall, I was really impressed with the Hard Candy Spring Summer 2017 line - a couple products were misses, but I generally liked everything, and a few were really amazing (that peach concealer!!!) Have you tried Hard Candy lately? I can't believe how pigmented those shadows are! Just especially admire that the palette comes with a mixing medium; definitely a nice touch! Right! Love the pigmentation and such a great little set for the drugstore! I love hard candy I just wish my local Walmart had a better selection! Great post! Yes I agree - need to see more at my local Walmart! I love the Metal Eyes kit, I just wish that the two dark bronze shades weren't so similar! I love the makeup look you did! The eyes are so gorgeous! Hard Candy is one of those lines that I used to reach for all the time but I haven't in the past few years. They seem to be releasing a lot of on trend items - I have yet to add a banana powder to my collection so maybe I should pick this one up! Great review & swatches! I haven't reached for them in a long time either, but I love what they are coming out with! Wow those shadows look amazing! What a steal for $9!!! All the products look great and I love the look you did with them. Thank you! And yes, such a great deal! I love that yellow/gold on you. It looks like Hard Candy is really coming up with some unique concepts lately. I really like them. Thanks Jill! I love a good yellow gold! The eyeshadows are so pretty, and look great on you! I've always written off Hard Candy, but I think I'll have to try a few things out now. I had written them off too to be honest, so I'm happy I tried then out! I love the look of the eyeshadow kit, but I wish they used a few more shades... Those two browns look awfully similar. Agreed - I like a little more variety! 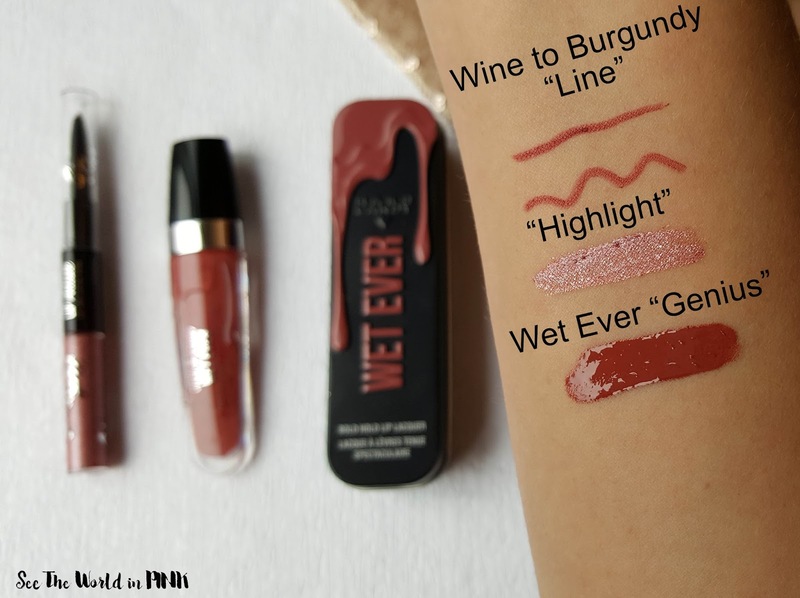 I JUST picked up the Wet Ever and their new metallic liquid lip as well and I'm so excited to try them out. I have Wisteria which is one of their velvet mattes that I enjoy a lot so I'm sure these two new formulas will be impressive as well. I didn't see these other products at my Walmart, but I hope they roll out asap so I can give them a look! oooh.. after trying this lippie I need to try some other kinds!